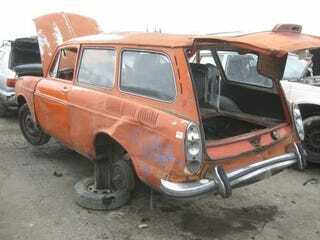 We just saw this '71 Squareback down on the junkyard, and now here's another one in a yard a few dozen miles away. This one seems to have passed the line separating "potential restoration project" to "parts car" quite a while back, what with all the torn-up steel on the right side. What happened to this car? Someone rescued the engine, which means some other VW will- ideally- avoid the fate of this one.